Making a coloring sheet seems like it should be pretty simple, right? Just draw out an image, scan it, and there you have it! 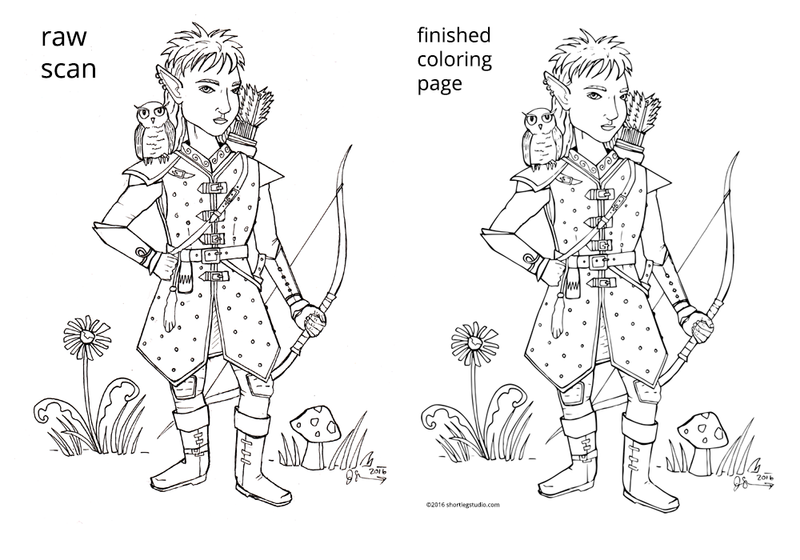 Well, I guess you could do it that way but I'm here to show you how I make my coloring sheets from start to finish. I am playing a Gnome ranger in a game this weekend, so I thought it would be fun to draw her first. Many people are surprised to find out it took an average of eight hours from conception to finished drawing for each image in my coloring book. A drawing may go through a dozen sketches and several full sized cartoons before I start the final drawing. As you can see below, for quite a few early sketches, I thought I might style my gnome ranger after the rebels' clothing on Endor. That didn't last long. (Her mullet, however, was there from the beginning.) Make sure you aren't violating anyone's copyright when you are drawing your images--it is not legal (or ethical, honestly) to trace or outright copy another artist's drawings or photographs! I start by scanning with an inexpensive canon scanner and then I use Adobe Photoshop and Illustrator to clean up my drawings. I use a HUION drawing tablet for adjustments to my drawing and for coloring, which will be a different tutorial. Note: I do not draw raw drawings with my tablet. I start with a rough sketch with a good old non-photo blue pencil and then use a mechanical pencil to finish the drawing on smooth Strathmore Bristol Board. Very low tech. Some artist prefer drawing pencils but I like the fine line I can get with a mechanical pencil. I made this next image a little more yellow so that you can see the non-photo blue rough outline that I drew over with the mechanical pencil. When I am satisfied with the pencil, then I ink in the image using my favorite Micron pens. I use sizes 005 and 01 the most. A lot of comic artists will use pen and ink with a nib or brush but for making coloring sheets, I've found the Micron pens to be the sharpest. When the drawing is inked and the pencil lines erased to the best of my ability, I scan the image and then open it in Photoshop. Note: I do the bulk of my clean up work in Photoshop and just one tiny detail in Illustrator. Some artists work primarily in Illustrator. There are as many ways of doing things as there are artists doing them! I prefer to work with a grid over my drawings so that I can easily work across each area in a methodical manner without losing my place. The grid is found under VIEW > EXTRAS (CTRL+H) and you can adjust the grid scale under EDIT > PREFERENCES > GRIDS. This drawing looks good shrunken down, but when you zoom into the raw drawing, you see what a mess the drawing actually is. I try to erase all my pencil lines, but it is hard with a mechanical pencil. At this level of zoom, you can see where the pencil didn't get erased and where the studs on the armor look more like squiggles than actual studs! I would love to pretend I am an effortless artist and all my drawings are perfect from the start, but here you go, my warts and all. Slowly, methodically, I use my tablet pen to go through every square pixel of the drawing and erase pencil and clean up messy marks. The Illustrator clean up works to do a lot of this too, but I like to control it myself. This erasing and redrawing takes the bulk of my time. Now, if you want, you can stop here and resize your image to make a PDF but the real creme de la creme is to convert your image to a VECTOR graphic, which creates smooth, camera ready lines. This is what we do in Illustrator. Now, at this point you can save your file as a PDF and then make a smaller PNG as a thumbnail if need be and you are ready to rock! This is what I do with my coloring books. But if I am going to be making coloring sheets to hand out or want to color the image in on the computer, I will save it in Illustrator and then open in back up in Photoshop. IMPORTANT NOTE: Make sure when you open the image back up in Photoshop, you select 900 pixels per inch or you will lose all the pretty lines you just smoothed out. I usually add a copyright mark before saving the final coloring page. Instead of printing them out on my computer, I will order copies from FedEx online and then pick them up at my local shop. It's a handy and inexpensive way to get your coloring sheets to the masses! Echo Sparkstone, Gnome Ranger, ready for adventures! Have fun on all your coloring page adventures and feel free to contact me if you have any questions! It used to be that the words self-published could make a person squirm. "Oh, sure, she has a book out. But it's self-published." I'm happy to say, that while this phrase can still roll many an eye, the tide is turning favorably for the self-produced (my preferred term) artist, writer, maker. Artists have been cranking out their own work for mass consumption for a long time. Photocopy shops were a great resource for putting out an underground magazine or comic. Nowadays, things are much easier. The internet, used for online printing and publishing, as well as promoting, has thrown the gates wide open on the publishing world. Now artists don't have to grovel to large conglomerates that will water their work down or take most of the profits. They can make the work themselves. This means a lot of junk work gets made. But hey, a lot of junk work was getting made when it was only the big distributors running the show. It also means that serious artists have to spend a lot more time on the promotion and business side of the aisle. Some may see it as a trade off, but I see it as more control over your own intellectual property. And it's hard work for small profits. Not everyone is going to have The Martian on their hands. Most makers will be distributing to a much smaller niche. But that just makes things hyper local. Your community is buying the products they want to have. But how to jump into self production? Kickstarter is one example of a crowd funding website that is gaining more and more popularity. Basically, the artist or maker comes up with a product idea. Usually they have a working prototype ready to send to publication but not the money to produce it up front. They come up with a bit of a sales pitch. Their page will include a video explaining the work plus a description of why they want to make it and why they need help. Then, they will ask for people to back their project by selecting any number of reward choices. You, as the artist, are asking people to put faith into you and pre-purchase your product. If all goes well, you will raise the required funds and then it's up to you to complete your project as promised and ship out all the rewards to your backers. It sounds so simple. The reality is certainly more complicated. I have been backing projects on Kickstarter for 4 years but only created my own project at the end of last year. I went to panels at Comic Cons, read up on tips online, and asked other friends that had created successful projects for advice. I have come up with a basic list of tips. 1) You need to have an audience for your project. Do not think that putting up an amazing project on Kickstarter will lead hundreds upon hundreds of backers to your doorstep. At the end of my project, less than 7% of my funds came from strangers that found me on Kickstarter. On your first project especially, most of your backers will be your friends. I recently read the idea that "friends don't translate into influence," meaning, just because you make a project, don't assume everyone you know will buy it. At the basic level, your best friend and your parents will support you. You need to convince your other friends and the rest of the world that you are making a worthy project. I recommend building your community for at least 6 months before starting a project. Write a blog, post carefully curated images on Instagram, start a podcast--basically, FIND YOUR PEOPLE. Find your people that are interested in what you do and will want the product you want to create. My project was a coloring book for adults. I started giving away free drawing pages on my website months and months before I launched my project. This helped me in two ways. Not only did it help build my audience, but it helped me to learn the process of turning a hand drawn image to a PDF using a scanner, Photoshop. and Illustrator. By the time I was making my coloring book, I was a pro at the process. This made everything go a little more smoothly. 2) Create a project plan and try to have as much of your project done before you launch. First, a project plan tells yourself that you are serious. What do you want to make? What is the scope? 40 pages or 48? Be as exact as possible. You can find examples online. It's important to have a baseline. What is your timeline? What do you need to create the project? Then try to follow your plan. You wrote down that you would do 5 drawings a week, but you are only doing 2. Thanks okay. Adjust your plan with a new draft and keep going. You want to have a lot of the project done at launch to show potential backers that you are serious. People will not back a project they think is sloppy or half-baked. I had all the rough drafts done for my coloring book but only about half the final drawings when I launched. It would have been much easier, and less stressful, if I had more of my final drawings done. You spend a lot of your time during your Kickstarter trying to promote the project. It's nice if you don't have to be worried about creation and promotion at the same time. You might add stretch goals at the end of your project and if those get funded, wonderful, you just created more work for yourself! That's fine, but know you have to finish the original work as well. 3) Be the Kickstarter project you want to be. Look at other successful projects. Back lots of other projects to see how the process goes. I had backed 22 projects before I created my project. Don't flat out copy other Kickstarter projects, but use them as an inspiration. It took me a full week just to create my Kickstarter page. You don't want to skimp here. Be authentic. You need a compelling story, lots of finished examples, a decent video, and a wide variety of rewards. I can't say it enough: if you aren't authentic and putting your best work out, people will see right through it. I won't talk a lot about rewards here but make sure you have some high and low options. What those levels are, are up to you. And it depends on the project. But having some one a kind, higher end rewards are nice to balance out your basic product. I offered original drawings from my coloring book along with completely original, created solely for the backer, coloring sheets on my high end. 4) Start small. Have a gigantic project in mind like a triple-A video game or a 200 page full color book of your illustrations? That's going to be expensive to produce. It's better to start small and put out a quality product than shoot for the moon and fall flat with a sloppy, poorly finished product. Remember, Kickstarter only funds--you only get money--if your project meets its goal that you set up before the project is launched. This is to insure that if you raise half of the money and can't finish the project, you won't run off with the money and leave your backers hanging out to dry. There are lots of saliva inducing stories of projects raising millions of dollars. It's usually a project that is backed by some celebrity. (See: Reading Rainbow and LeVar Burton.) This probably won't be you on your first project. And it all goes back to finding your people. If you are only doing this to create money and not to create some neat idea you have, then you should probably rethink why are you doing it. 5) You are raising money for a project, not your lifestyle. Kickstarter isn't meant to pay your salary for a year while you paint on a beach. (You could use GoFundMe or Patreon for that, but not sure how many backers you would get!) Kickstarter is for making a project, period. Carefully write out all your expenses for the project. You'll be surprised to hear that many projects end up using 30% or more of their funding just to MAIL out the finished products! Plan for this in your goal. Think carefully of production costs, mailing, Kickstarter fees (about 10%), the packaging you will need, federal income tax, and art supplies. Don't forget sales tax! I had to back out sales tax out of all my orders in Washington state and that comes in close to 10%. I didn't pay myself in my project but I did budget for the graphic artist I used to format the book for me. 6) Keep your Kickstarter fundraising length as short as possible. Kickstarter recommends around 30 days. That is too long for most projects. I made 27% of my funds in the first few days, 10% over the next few weeks and then over 60% in the last two days. It's very stressful. You want to keep your freaking-out-I'm not-going-to-make-it time to a minimum. If you are aiming for under $10,000, 25 days is probably more than enough. You want to allow time to build momentum but you don't want people to forget about your project. 7) Promote your project. If you did your homework and found your people through blogging, Instagram, Twitter, Facebook, Reddit, and the like, you'll have a good start and ready to go forth and conquer. Send out a press release. Don't send out tons of mass emails. Email individuals. You want them to care about you, so care about them in return. It helps if you can get shout outs on other blogs or websites. Facebook advertising was great at getting traffic to my page and getting more likes, but didn't help too much with actual backers. Remember, they have to trust and like you before they will invest in you. 8) Don't wait for perfection. I had quite a few "helpful" friends earnestly tell me to make sure my project was perfect before I launched. It ended up making me doubt myself. Don't listen to those people. Avoid negative people in your life during your whole launch, if possible. (You know who they are.) There's a difference between perfection (which is pretty much unrealistic) and putting out your best work. I'd already seen so many mediocre coloring books out there, I knew mine was a step up artistically from the get go. Can it be better? It can always be better. But if I had allowed myself two more months to work on my project before launching, I would have made many of the same mistakes. A lot of things you figure out once you are in the middle of your project or at the end. Waiting until it is perfect means you will always be making excuses why you didn't finish the project. Now, when I am ready to launch my next project, I will know even more and be more confident in my success. 9.) Always do a project review when you are done. I learned this trick from my husband who is in the software industry. Whether the project was successfully funded or not, review what went right and wrong. Were you realistic with your timeline? Were production costs more than you planned for? Did you mail everything out on time? Did you waste time having to create t-shirts for a small handful of backers? Lots of people include t-shirts in their projects as rewards. But if you are making something electronic or a piece of art, that can add a whole lot to your budget that's not going towards your project. Think of the project review as a project debriefing. Trust me, you won't remember all the details three months from now. Write it all down while it is fresh in your mind. Also, think about what was fun and what wasn't fun. I love organizing things, so I liked a lot of the Kickstarter process. I hate selling my work in person. This is why I work mostly online these days and don't sell anymore at craft fairs. 10.) Did you like enough to do it again? Well, ready, set, go! Seeing a project completed, an actual book that people can buy in my local bookshop or online (Buy Fortuna Here!) is exhilarating. Sometimes, the hardest thing about creating a project is getting started. You see the long path before you and you just want to sit on the sofa instead. But small steps, like writing a plan and adjusting as you go, helps. We are far too unrealistic in our goals and when we see baby steps, we just want to give up. But if you have a plan and see your slow, but steady pace, you can see the end of the path too. If you wait, you are only going to be that much older and not have your novel written or your album recorded or your cookbook published. Kickstarter isn't for everyone. Think carefully about what you want to create and why you want to create it and why people might like it. If you are creating steady, good work, people will show up and support you. But first, you have to believe in yourself.